The troubleshooting information for install time issues is all maintained at the bottom of the Install Guide which you can find here. If you've got an old version of QuantaStor and the new packages are not showing up in the Upgrade Manager then often times we find that the network gateway IP address is not set correctly. The easiest way to verify this is to login at the console for your QuantaStor system and then use ping to ping a well known address like www.google.com. If it is not reachable then likely you don't have the gateway configured on any of your network ports or you have the gateway configured on too many network ports. The other thing to check is to ping 8.8.8.8 which is a well known google DNS server. If it is reachable then your gateway is configured properly. If at the same time www.google.com is not reachable then your DNS settings need fixing. If you right-click on your storage system in the Storage Systems tree stack and then choose 'Modify Storage System' and that will let you set the correct DNS server(s) for your environment. The gateway setting is on a per port basis so you'll need to right-click on a network port in order to set that. Make sure that you have cleared your browser cache. QuantaStor's web interface is cached by your browser and this can cause problems when you try to login after an upgrade unless you hit the 'Reload' button or 'F5' in your web browser to force it to reload the web management interface. Also in some instances where the internal web server has restarted you may also need to hit reload to clear your browser cache. This is always the best place to start as it is the easiest thing to check and resolves the issue 90% of the time. Make sure that the Tomcat web service is running, or restart it. To do this you'll need to login at the console or via SSH. Make sure that the QuantaStor core service is running, or restart it. To do this you'll need to login at the console or via SSH. If the above hasn't resolved the issue try clearing your browser cache, restart your browser, and then hit the reload button after entering the URL of your QuantaStor system. Be sure to give the service about 30 seconds to start up. You'll need to wait a minute for the service to startup before running the sys-get command but if it succeeds then you've successfully reset the password. Once you have the localhost entry set correctly you should be able to login via the web interface again. With Quantastor v2 you do not want to use the command "apt-get upgrade" or the dist-upgrade. This is because QuantaStor uses a custom kernel based off of a specific version of Ubuntu. Calling apt-get upgrade will result in Ubuntu trying to update to a newer version of the standard kernel which does not include the custom SCSI target drivers. The easiest way is to reinstall quantastor. After the install is complete you can go into the Recovery Manager in the web interface. This will recover the metadata and the network configuration, and the pools will auto recover. Alternatively you can use commands like 'update-initramfs -k 3.8.0-8-quantastor' to restore the kernel back to the quantastor custom kernel which include the custom drivers and such. The underlying Ubuntu distribution used by QuantaStor v3 is Ubuntu 12.04.1 and we use a 3.5.5 linux kernel. In some cases the drivers included with the kernel we use are not new enough for your hardware and in such cases we recommend downloading and building a the latest driver from the manufacturers web site. If you have questions regarding a particular piece of hardware just send us email to support@osnexus.com, we may have a driver for your hardware already built which you can use to patch your system. We have heard of problems with Jumbo frames with Chelsio T4 controllers with MTU set to 9000 with VMware. If you see this try changing it to MTU 9216 in QuantaStor and MTU 9000 in VMware. We have seen some problems with these NICs with QuantaStor v2.x which uses the older 2.6 kernel. If you're using a Solarflare NIC be sure to start with QuantaStor v3.x. If you see a little gear icon on the disk then it has been detected as a boot drive which cannot be used for storage pool creation. In the RAID controller boot BIOS you can reconfigure this so that your RAID unit for storage pool creation is no longer tagged as bootable. QuantaStor does this check to ensure that you cannot inadvertently create a storage pool out of your boot drive and which would reformat it. You've got a disk you select it to create a storage pool but the pool creation fails part way through. Typically this is because the disk has a partition on it or is marked as a LVM physical volume. 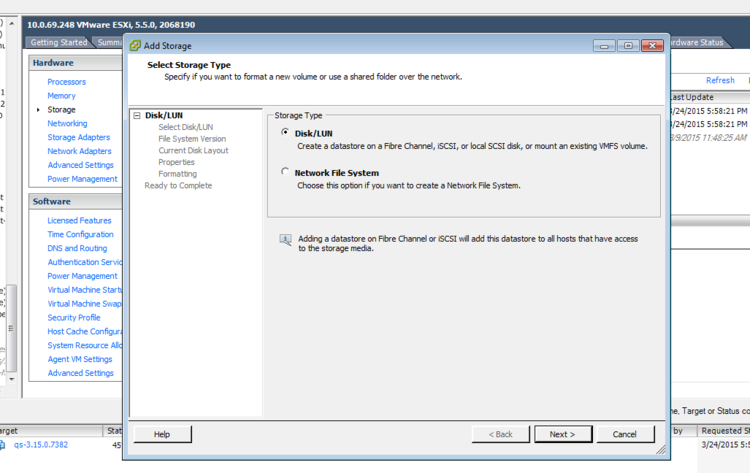 If it has LVM information on the disk you'll need to use the pvremove command on the disk to clear it. If the disk has a partition on it, you'll need to remove the partition before QuantaStor can use it. QuantaStor does these checks to ensure that you do not inadvertently overwrite data on a disk that is being used for some other purpose. If you are unable to create a storage pool because the device has prior partitions on it there is a script you can execute. The script can be found at /opt/osnexus/quantastor/bin/qs_dpart.sh and takes in the device as a command line argument. WARNING: Make sure you do not run this script on the boot device or the wrong storage pool! Often times XenServer issues can be traced to network issues so anytime you're having trouble accessing your storage it's best to start by doing a 'ping' test from each of your XenServer hosts to each of your QuantaStor systems. To do this just bring up the console window on each of your Dom0 XenServer hosts and then type 'ping <ipaddress of quantastor box>' for example, if you have a QuantaStor system at 192.168.10.10 you would type 'ping 192.168.10.10'. If it says 'destination host unreachable' then you have a network configuration issue. The issue may be with the VLAN configuration in your switch or it may be that the QuantaStor system and XenServer host are on separate networks. Be sure to review your subnet mask (eg 255.255.255.0) and the IP addresses for both. Once corrected try the ping test again. Once you can successfully ping you're ready for the next level of checking. Another common mistake is to forget to assign all the storage volumes to all the XenServer hosts. If you're having trouble connecting a specific host that should be the first thing to check. To do this, go to the Hosts section within the QuantaStor Manager web interface, select the host that should have the volume and then make sure the volume is in the tree list off the host object. If you don't see it there, right-click on the host and assign the missing volume to the host. For example you 'iscsiadm -m discovery -t st -p 192.168.10.10'. If you don't see the target list come back from the storage system and the list is blank then you've got a storage assignment issue. It could be that you have the incorrect iqn assigned to the host or some typo in it. Re-verify the IQN for the XenServer host and make sure that your QuantaStor system has the volume(s) assigned to the correct IQN. If you get an error back like "iscsiadm: Could not scan /sys/class/iscsi_transport" or the iSCSI service is not started then you'll want to try restarting the iSCSI service on the XenServer host. Note you will want to change the part 'ee46dcfc' to have different letters and numbers so that you have a unique IQN for the host. The host may already have one assigned which you can find in the 'General' tab within XenCenter. Take that IQN and replace the one above with it and the InitiatorAlias should be the name of your XenServer host. Once you have that file in place, try stopping and starting the open-iscsi service as noted above. Then try the iscsiadm discovery command again as noted above. At this point you should be able to see a list of iSCSI targets from your QuantaStor system. If you're working on repairing an existing SR, try repairing it again. At this point try repairing or creating the SR again as needed. Once set you can try doing a manual login as noted above or try doing the SR repair again. After you have your iscsid.conf file configured you'll need to restart the initiator service, re-run the discovery, and then login. Re-running the discovery command is important as it seems to clear out stale information about the previous CHAP configuration settings. In very rare instances you may run into a scenario where you're unable to delete a snapshot in the QuantaStor web interface where the error reported is "Specified storage volume 'volume-name'" has (1) associated snapshots, delete volume failed.". If you see an error like that there's a utility included with QuantaStor that can assist with cleaning up any orphaned snapshots. To use the utility you'll need to login at the console and run some commands. Next you'll run the qs_zfscleanupsnaps.py command with the --noop argument so that it doesn't take any action to delete anything, it just scans for orphan snapshots. Here's what the output looks like, and you can see that these snapshots it would skip over because they're not orphaned. NOTE: Be careful with the 'zfs destroy' command. If used with the -R flag it will recursively destroy all dependents of the snapshot. Attempt to repair the Storage Volume (ZVOL) in place using the zvolutil to correct the bad blocks by overwriting bad blocks (formatting them) with zeros which in turn repairs the ZFS checksum so you can continue using your ZVOL. If you use the zvolutil repair you must do a file-system check on any filesystems contained within the ZVOL (which may be multiple if there are many guest VMs contained within the ZVOL), so that you can detect and address any downstream files which may have been damaged. The granularity at which zvolutil does repairs is at the 4K block level (which is currently the smallest possible chunk that can be read/written). So if you have a single 4K bad block then that is the only block that will be effected by the repair. zvolutil provides a means of clearing bad sectors in a ZVOL due to bit-rot. which files or filesystems, if any, have been corrupted / effected by bit-rot. so you can continue using it. You may still need to recover data from backups. : prints a '.' for good blocks and a 'e' for bad blocks. : with zeros which in turn updates the ZFS checksum for the block. If you run into an error like "Remote storage system and local system have the same storage systems IDs" this is because you have two systems with the same storage system ID. To correct this you just need to create a file '/etc/qs_reset_ids' and then restart the QuantaStor service. This will reset the storage system ID for the local system. Note that your license key is tied to the storage system ID so resetting the storage system ID will require that you reactivate the license or get a new one. Note also that qs_reset_ids will generate a new storage system ID and a new gluster ID for the system. If you want to generate a new ID for just the system you can use 'touch /etc/qs_reset_sysid' or to just reset the gluster ID you can use 'touch /etc/qs_reset_glusterid'. Generally speaking though you'll want to use /etc/qs_reset_ids because if you have a conflict of IDs with one you'll almost certainly have a collision with the other and /etc/qs_reset_ids will fix both. When a Storage System ID is changed on a QuantaStor due to a re-install of the OS or the use of the 'qs-util resetids' command, it will present out the Storage Volumes on it's Storage Pool with that new Storage System ID. This will cause some clients to believe it is a new Storage appliance. When this happens, hypervisors like VMware will mark their Datastores with an all paths down state which will require some manual steps inside of VMware to re-import the datastore and any VM's stored on that datastore. Procedures vary across hypervisors, please consult the documentation for your specific hypervisor platform. NOTE: If the re-installation was due to a bare metal upgrade from ISO media, you can use the 'Recovery Manager' in the web management interface to recover the old configuration database which is automatically backed up on all storage pools every hour. After recovering a prior database you will need to reboot the appliance. The following sections will guide you through the process of re-importing a VMware datastore that has a different Storage Volume ID on it. 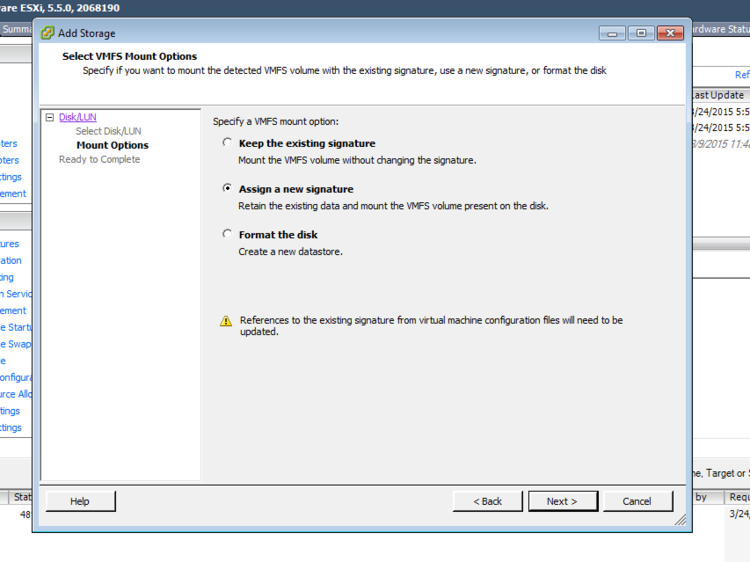 This procedure is necessary if you're importing a remote-replica of a Storage Volume or you have reset the system IDs on an appliance such that VMware now no longer recognizes the storage volumes as the originals. 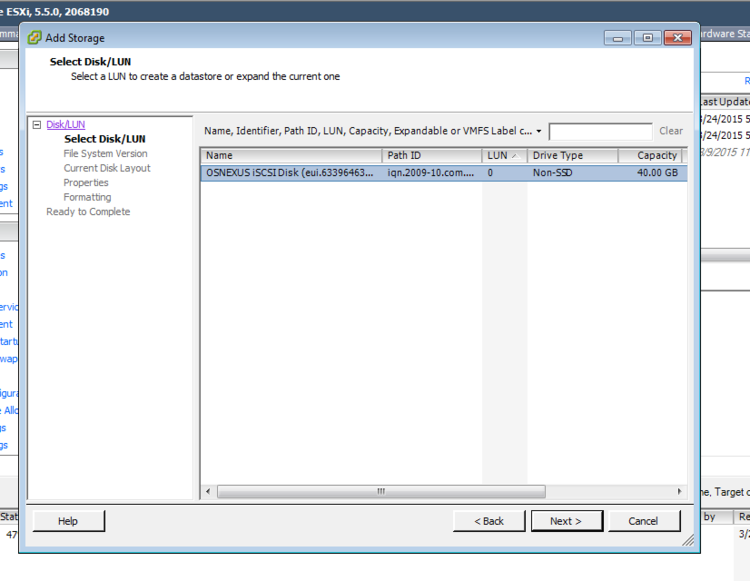 Use the Add Storage Wizard in the Storage section of VMware vSphere to add the LUN and DataStore back into VMware with a new Signature. 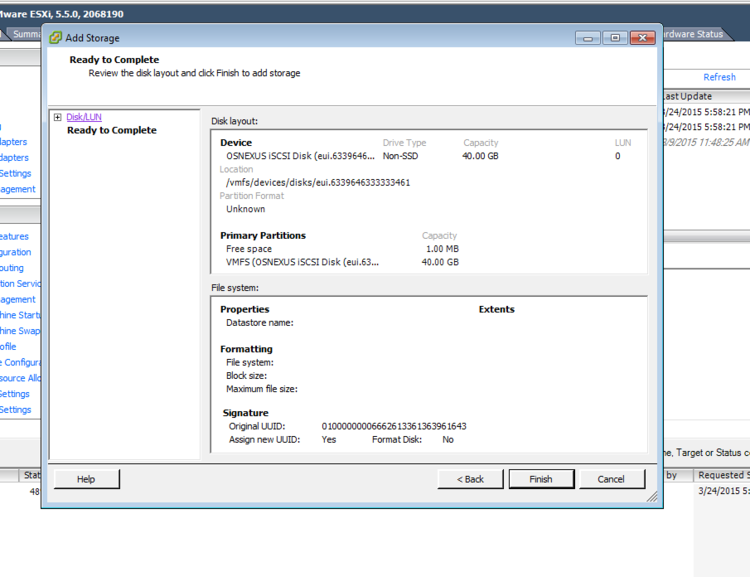 The key steps in the Add Storage Wizard is detailed in the below screenshots. To be able to rename the Datastore back to it's original name, you will need to remove any inaccessible VM's from inventory that referenced the original datastore name. e.g. in the screenshot below, there are VM's listed as inaccessible that referenced the original datastore. Once the last of the referencing VM's have been removed from inventory, the old datastore that has an inactive status will no automatically be de-listed by VMware from the list of Datastores. You can then rename the imported datastore back to the original name as shown in the below screenshots. Now that the Datastore is available, you can browse the Datastore and add all of the VM's back to the VMware inventory with the 'Add to Inventory' option. 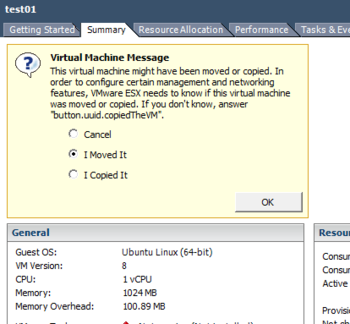 You will need to ensure that when powering the VM's up, that you tell VMware that they were 'Moved'. This is detailed in further detail in the screenshots below. For two QuantaStor systems to communicate in a grid you'll need to open up tcp ports 5151 an 5152. Without those open nodes cannot communicate with each other to exchange metadata. For replication of volumes and network shares between nodes you'll also need to open up port 22 but you've probably already opened that in order to get ssh access to the systems. The QuantaStor management services audit logs are located at /var/log/qs_audit.log. You can view and search them using standard less, more and grep linux utilities while logged onto a QuantaStor unit. The qs_audit.log file is also included in every QuantaStor log report, so you can grab a log report from the system using qs-sendlogs and instead of uploading the .tar.gz file, you can copy it to a workstation and then extract and review the files using your preferred text editor. Each line of the audit log represents a single task and it's status that the QuantaStor is processing. every action in QuantaStor is handled by the task manager. Much of this information is also available in the properties of a task in the task list view for recent actions in the WebUI. This page was last modified on 12 February 2016, at 12:47. This page has been accessed 114,110 times.